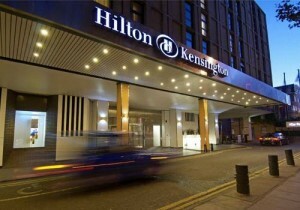 Situated in the elegant Holland Park district, the Hilton London Kensington Hotel offers a modern gym and sauna 5 minutes’ walk from Westfield Shopping Centre. It features a chic restaurant and lounge. Decorated with modern art, the WestEleven Restaurant serves a range of modern British dishes. The stylish, 24-hour AmPm lounge is set within the lobby and offers an á la carte menu, a wide selection of drinks, and computer terminals with internet access. Shepherd’s Bush Rail and Underground Station and the lovely Holland Park are just a 5-minute walk from the hotel. Hyde Park is either a 25-minute walk or a short underground ride away. The historic Coronet Cinema can be reached in 10 minutes on foot.